The Mourning of Muharram and Remembrance of Muharram is a set of rituals associated with both Shias and Sunnis, which takes place in Muharram, the first month of the Islamic calendar. Many of the events associated with the ritual take place in congregation halls known as Hussainia. The event marks the anniversary of the Battle of Karbala when Imam Hussein ibn Ali, the grandson of Muhammad, was killed by the forces of the second Umayyad caliph Yazid I at Karbala. Family members, accompanying Hussein ibn Ali, were killed or subjected to humiliation. The commemoration of the event during yearly mourning season, from first of Muharram to twentieth of Safar with Ashura comprising the focal date, serves to define Shia communal identity. At present, Muharram observances are carried out in countries with a sizable Shia population.The wordsAzadari which mean mourning and lamentation; and Majalis-e Aza have been exclusively used in connection with the remembrance ceremonies for the martyrdom of Imam Hussain. Majalis-e Aza, also known as Aza-e Husayn, includes mourning congregations, lamentations, matam and all such actions which express the emotions of grief and above all, repulsion against what Yazid stood for.Expression of grief with thumping of the chest by Shia Muslims is known as Latmya, Latmaya or latmia in Arabic-Persian countries. 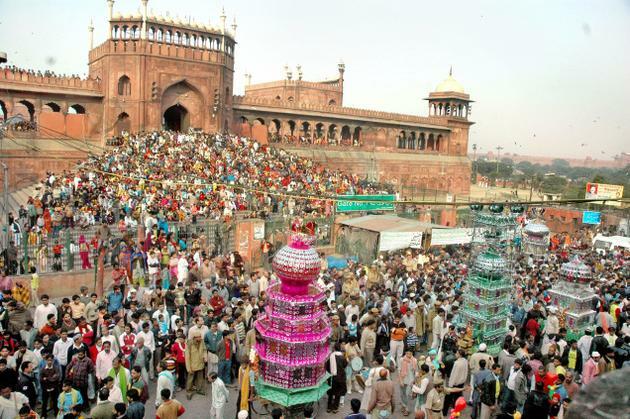 In India and Pakistan it is called Matam or Matam-Dari/Sina Zannee (chest beating).Muharram rituals were often called by European observers "the Feast of Hasan and Hosayn," as the participants shout "Hasan! Hosayn!.Reliable evidence of public mourning rituals dates back to 963 CE.Expressions of grief such as sine-zani (beating the chest), zangir-zani (beating oneself with chains), and tage-zani or qama-zani –also known as tatbir (hitting oneself with swords or knives)– emerged as common features of the proliferating mourning-processions (dasta-gardani) during Safavid rule. Mourning rituals take place in assemblies held in so-called Hussainiya or takia, as well as in mosques and private houses.Iit is customary for mosques to provide free meals (nazar) on certain nights of the month to all people. These meals are viewed as being special and holy, as they have been consecrated in the name of Imam Husayn, and thus partaking of them is considered an act of communion with Allah, Imam Husayn, and humanity.One form of mourning is the theatrical re-enactment of the Battle of Karbala. It is called taziya or taziyeh. Theatrical groups that specialize in taziya are called taziya groups.Taziyas are popular and taziyas continued to exist especially in more rural and traditional areas. MAY PEACE AND BLESSINGS OF ALMIGHTY ALLAH BE WITH YOU THIS YEAR AND ALWAYS. INDIA FIRST, I AM INDIA, I LOVE MY INDIA AND I AM PROUD TO BE INDIAN. Thanks Ghazala for reading my blog.Your comment is highly stimulating and arousing.